August 30, 2018 / Guest / Comments Off on What are Engineering Thermoplastics? Today the term is conveniently applied to certain families of thermoplastics which have a higher performance than the group of thermoplastics labelled ‘Commodity Thermoplastics’. By performance we imply superior properties for more demanding applications. In particular, these are mechanical strength and resistance to impact, heat and chemicals. The distinction between the two groups also refers to production volume and price. The workhorses of the Engineering Thermoplastics are the polyamides (PA 6, PA66), polyesters (PET, PBT), polycarbonate (PC), polyacetals (POM) and acrylonitrile-butadiene-styrene (ABS). These are applied extensively in automotive, electronics and other industrial sectors. However, the term Engineering Thermoplastic should not be interpreted as plastics exclusive to solving engineering problems. This is because some of the commodity thermoplastics can offer a cost-effective solution to engineering problems. Think about the use of high density polyethylene in gas transmission pipes, polypropylene in geotextiles and PVC in chemical storage vessels. The secret of improved performance lies in the chemical structure of the base polymer. 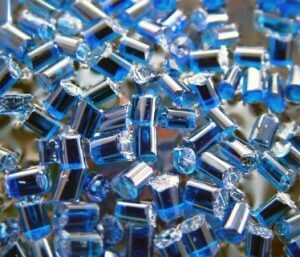 However, we should not forget the role that additives play in enhancing the properties of engineering thermoplastics. Incorporation of glass fibre not only increases stiffness values by a factor of 4 but can increase heat distortion temperatures by 100oC and significantly reduce mould shrinkage and dimensional instability. This Engineering Thermoplastics article was written by Dr. Charlie Geddes for Hardie Polymers. For more of Charlie’s blogs why not read more of Hardie Polymer’s knowledge base articles? For information on all the specified grades that Hardie Polymer’s can offer contact them on the below or try their polymer search.